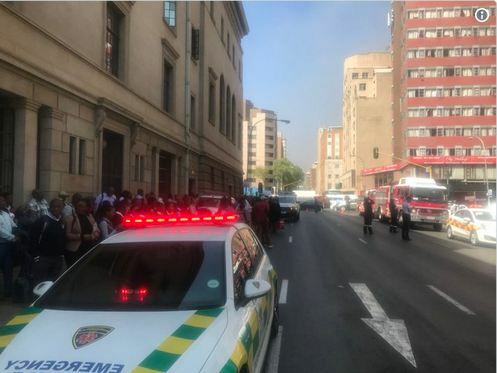 A firefighter fell to his death while battling a blaze on the upper floors of a government building in the Johannesburg CBD on Wednesday morning. The city’s department of public safety’s Twitter account confirmed the death. Johannesburg Emergency Services spokesperson Nana Radebe told News24 that paramedics were on the scene. Tweets from Independent Online confirmed that a body lay on the pavement next to the building. Radebe said the building was evacuated after the fire broke out. The building is shared by the departments of health, human settlements and co-operative governance. A staffer who wished to remain anonymous told News24 that the fire started at the health department’s side of the building. It was apparently on the 23rd floor. The woman said about three or four firefighters went into the building as it was being evacuated. While outside, she witnessed windows exploding and a firefighter rolling on the ground.